Just a quick blog tonight as I'm feeling a little under the weather (story of my life these days). Anyhow, catching a few minutes of Masterchef this afternoon, I started lusting after cheese scones - they'd been served with roasted pepper and tomato soup in this case, bring on the cold weather - so I thought I'd knock up a quick batch for Miss Abigail's tea so I could have a sneaky one. I make amazing plain scones - don't get me started on the subject of sultana ones - but I haven't made cheese scones since school. A quick search of BBC Good Food and I found a fab recipe that is simplicity in itself. Only downside that a tantrumming toddler meant that I left them in a few minutes longer than I should have and if I was really living the Great British Bake Off dream, I'd've fallen foul of the Silver Fox for over baking. Nevertheless, the slight crunch to the outside only served to enhance the lovely fluffy middles IMHO. This is a recipe that could be used time and again and improved on by other flavourings - chorizo and thyme; bacon; onion; chives; rosemary - the list is endless. Perfect accompaniment to soup and a recipe learned just in time for the snow that's apparently been predicted for next week. 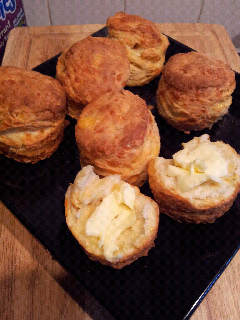 Picture of the scones to follow as the phone is flat - again! Recipe can be found here.